favorite recipe with your friends. You have already voted today. Add all ingredients to a mixing vessel and stir until chilled and properly diluted to taste. Strain over one large cube in a double old fashioned glass. 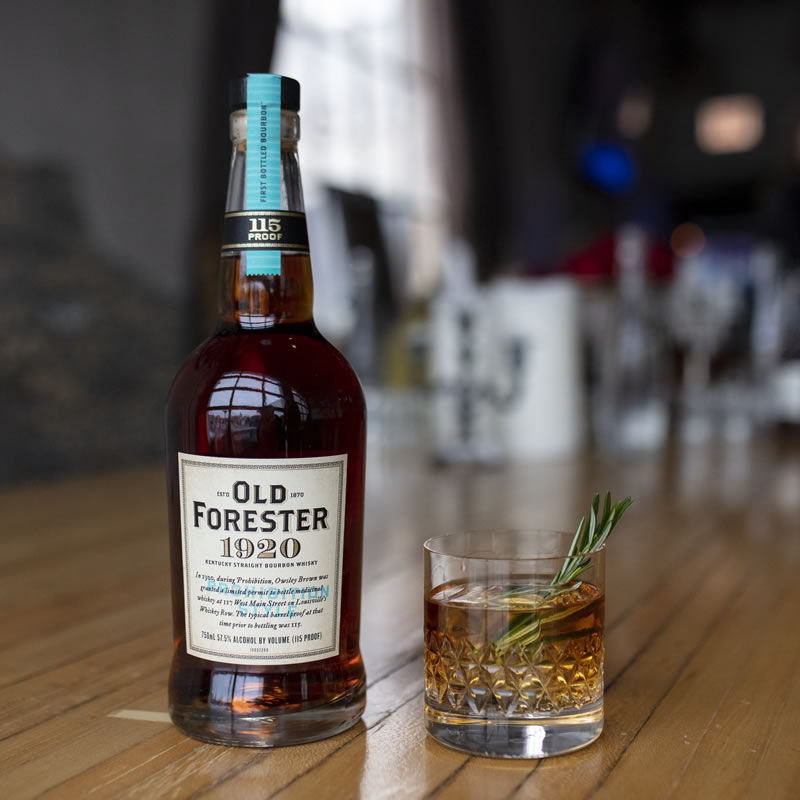 Garnish with one sprig rosemary and consume while hanging out with your favorite doggo. Add all ingredient to sauce pot and stir while bringing to very low simmer. Allow to simmer on low for 15 minutes. Let cool and fine strain with chinois. Put one dash of Xocolatl Mole bitters in a mixing glass. 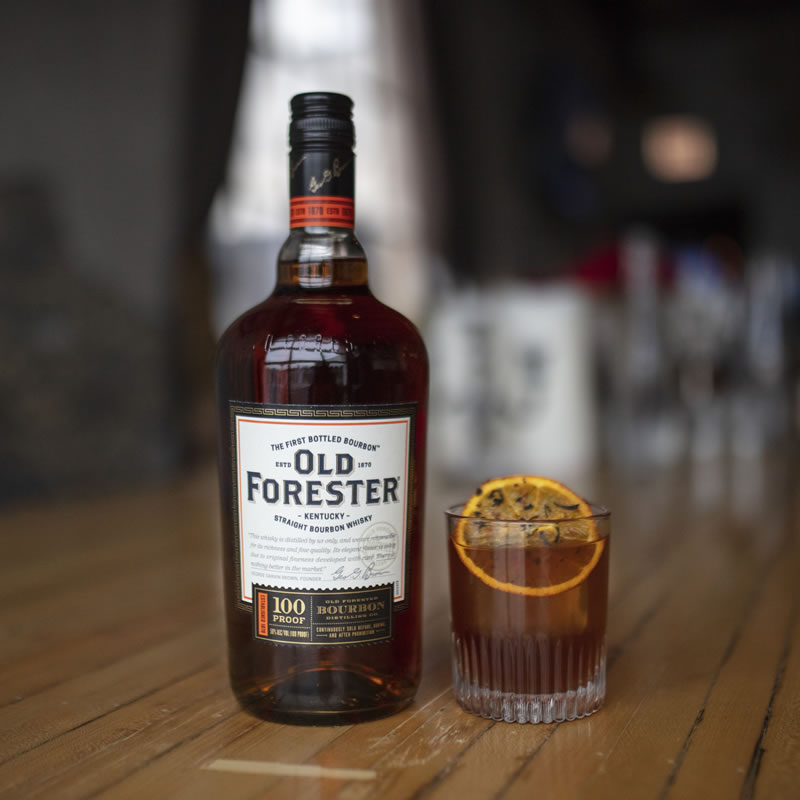 Add 2 oz of Old Forester 1910 Old Fine Whisky, then fill with ice. Top with .25 oz Chile de Arbol/Cherry Reduction, then stir for approximately 20/25 seconds. 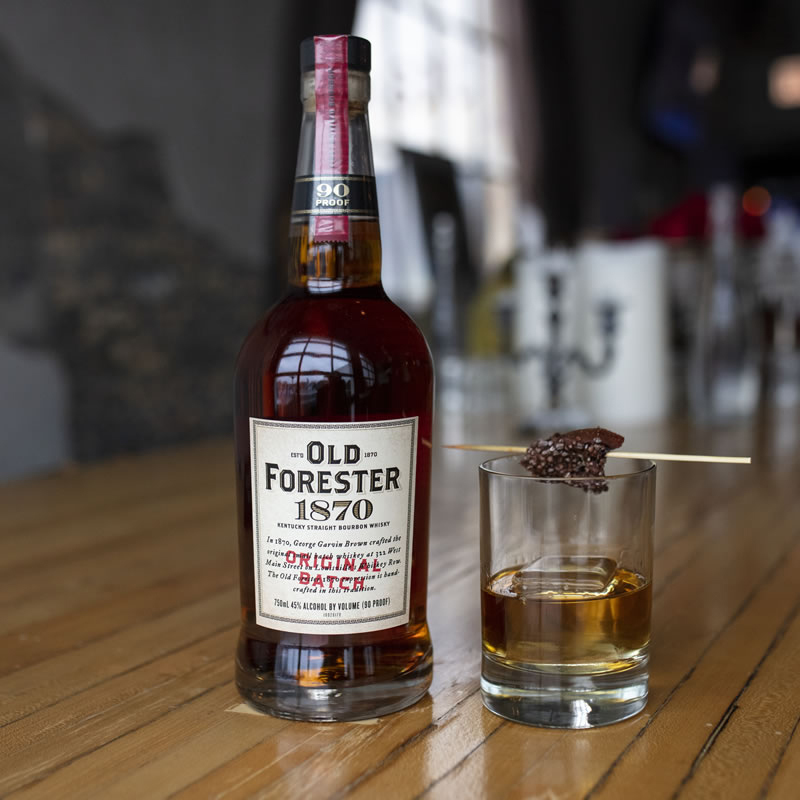 Strain over fresh ice into a double old fashioned glass and garnish with 2 cherries and a chile de árbol on a bamboo pick. Stir until diluted and chilled. 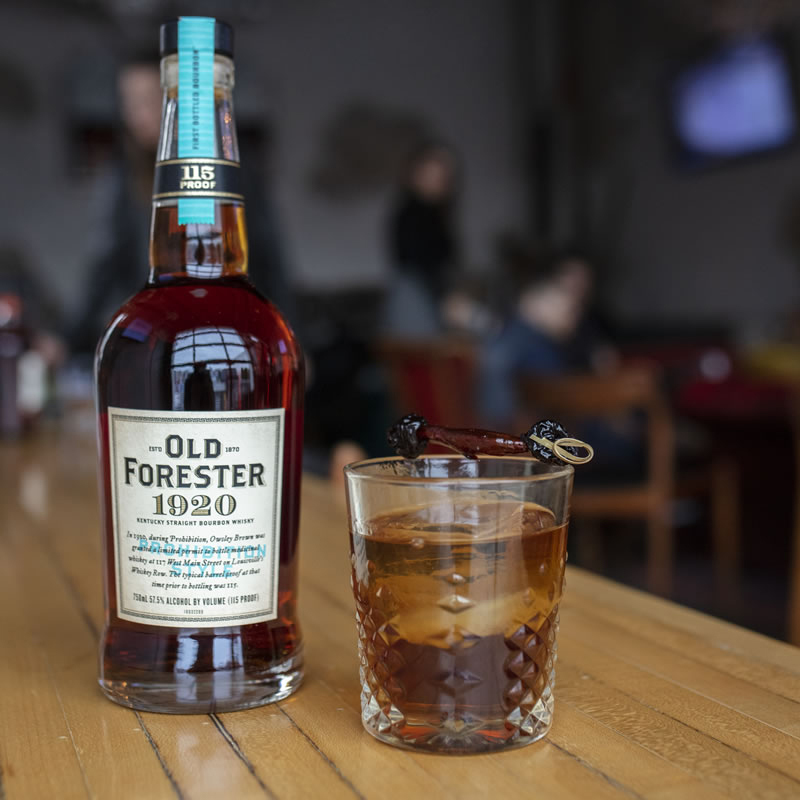 Pour into Double Old Fashioned glass over rocks. Garnish. 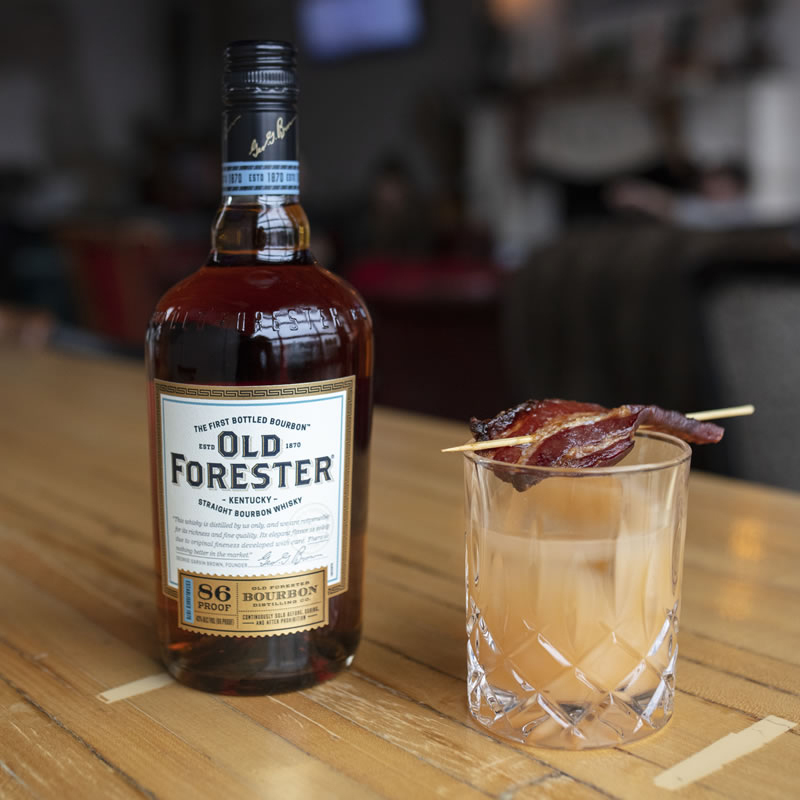 Combine all ingredients in a stirring glass over ice, stir, strain into rocks glass over ice block, garnish with brown sugar candied bacon on a skewer. 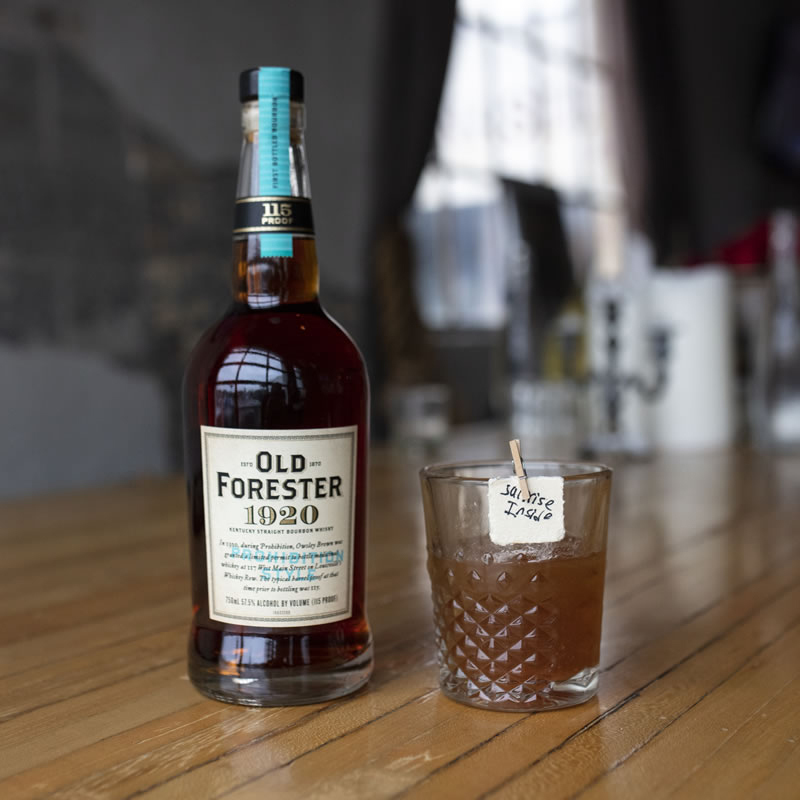 Combine all ingredients in an old fashioned glass, stir to incorporate flavors. Add one 2.5" ice cube and stir 20 times to chill. Garnish with cocoa dusted freeze dried honey wafer. Combine 300 grams orange peel with 1000 grams demerara sugar (preferably in a vacuum seal bag) let sit for 72 hours. Add 1 liter cold water and whisk until dissolved, strain, bottle, label and date. Combine .75oz lapsang souchong tea and 1 liter 180 degree water. Let Steep for 10 minutes, strain, cool, bottle, label and date. Build all ingredients (except espresso) in a mixing glass and stir to proper dilution. Rinse a rocks glass with 1.5 oz espresso and strain cocktail into glass over a large ice cube. Peel 4 blood oranges completely, cover peels with 4oz of white sugar. Muddle peels and sugar together and let stand for several hours until the oils have been extracted from the peels. Remove peels and transfer oleo-saccharum to a sealed container. Garnish with a "surprise" and the tiniest clothes pin you can find. and drop three drops of smoked saline solution on the top for smell. *To make Crema Earl Grey Syrup, simmer 1 cup of water, 1 cup of granulated sugar, and a heavy teaspoon of Crema Earl Grey tea leaves for four minutes. Strain and let chill. *To make Dehydrated Orange Wheel, slice orange into 1/8" wheels, dip wheels in simple syrup, and sprinkle with tea leaves. Place in dehydrator set to 140 degrees for 8-12 hours. Stir all ingredients in mixing glass with ice. Strain over fresh ice and garnish with dehydrated orange wheel. Enjoy with friends in a room with no television or digital screens. Check back and share your favorite recipe with your friends. You have alreay voted today. Please try again tomorrow. 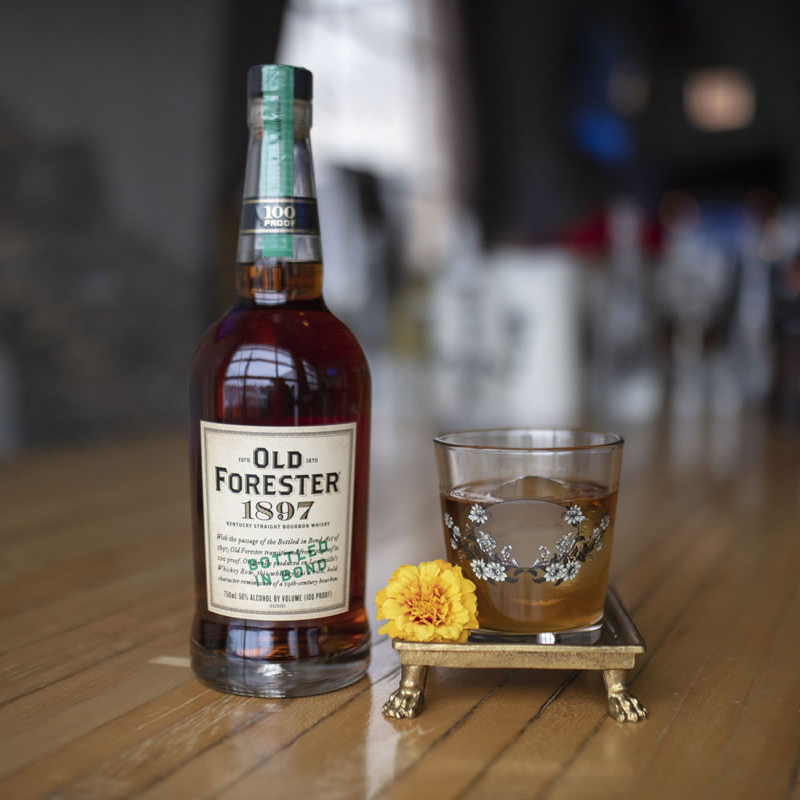 Brown-Forman Distillers. All rights reserved. All other trademarks and trade names are properties of their respective owners.